As we made our way down Delsea Drive, my date and I could not miss the restaurant welcoming us with bright outside lights. It was time for our Valentine’s Day dinner at Italian Affair. From the outside, the restaurant looked pretty small and ordinary. But as we walked in, those preconceptions were immediately challenged. We were greeted with big smiles and the smell of authentic Italian food — the start of a great night. My date and I had made a reservation for 7 p.m., and we were seated by a friendly hostess without a second of waiting. There were two separate seating sections. The first section was inside with live music in the corner of the dining room. To help celebrate Valentine’s Day, there was a solo singer playing acoustic guitar. The lights were dimmed, just enough to still be able to see your partner’s face. We were seated in the second seating section — a covered outdoor deck decorated with a water stream, flat screen televisions and a bar, warmed by fire pits and heaters. All of the tables had pink napkins folded into roses. Talk about romantic! The first and only complaint of the night I had was the chill from the wind draft I could still feel despite the covering and fireplaces. I looked around and couldn’t help but notice that most of the women were eating with their jackets on. Our waiter came to greet us within a minute of sitting down, presenting us the special Valentine’s Day menu and drink menu. The servers were all dressed in red to match the romantic theme of the night. My date and I were surprised to find reasonable prices at the casual, yet classy Italian restaurant. Nothing was over $30, besides the bottled wine, which of course, we had to try. Our waiter was extremely accommodating, even after telling us that due to the special evening, the chef was not allowing any substitutions. He worked through the menu with us, made recommendations and took our order swiftly. He came back with our bottle of Santa Carolina Merlot and poured our glasses for us. He remained attentive throughout the transitions of our courses, making it clear our happiness was an important part of serving us. The food came out exceptionally fast, which was great, for my date and I nearly starved ourselves all day in anticipation of this meal. Warm bread was served first with olive oil mixed with herbs. We were then served our appetizer — stuffed calamari with marinara sauce. It was a little too fishy for my taste, but the ricotta cheese and crabmeat stuffing was good. As soon as we were finished with the appetizer, the Caesar salads that came with both of our entrees arrived. Although the dressing differed a little from the traditional Caesar dressing, I enjoyed it. Our entrees came out steaming. My boyfriend ordered the salmon with linguini and spinach, smothered in a butter sauce. I ordered the four cheese sacchetti pasta with pears in a champagne sauce. We both found ourselves in food heaven. The first thing my date said after tasting his meal was, “You have to try this butter sauce, it’s delicious.” I leaned over, took a taste of the salmon and agreed. I am not a seafood lover, but this salmon was great. It was tender and full of flavor. With the first bite of my pasta dish, I was surprised, in a good way, with the combination of the cheese sauce and pear flavor. Never in a million years would I think to pair pasta with pears, but it worked exquisitely. It was honestly one of the best pasta dishes I’ve ever eaten. Our waiter came back to clear our plates not long after my date and I licked them clean. He asked if we were interested in dessert, and of course we could not resist. The dessert menu had many options, including two specials: chocolate strawberry shortcake and coconut cheesecake. 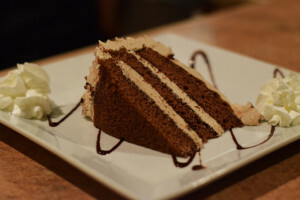 Our waiter suggested the coconut cheesecake, and although that was tempting, as I am a coconut lover, I compromised with my date for the chocolate mousse cake. The cake was moist and fresh. It was a big enough slice to share, and small enough to leave us satisfied at the end of our meal without feeling overstuffed. All of the food was stellar, along with the service. I’m hooked, and I definitely plan on going back.